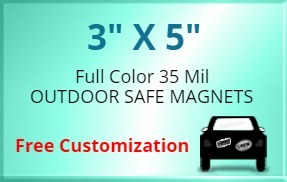 3x5 custom magnets - outdoor & car magnets 30 mil square corners works for most small budget marketers eyeing to stir a storm with their promotions. This magnet is UV safe, which means it can stay in good shape even while driving under harsh sunny conditions or windy days. It can be considered for bulk gifting during promotional events such as tradeshows, shopping fests, festive sales driving, etc. It perfectly fits into line of all those small budget marketers who have been thinking that small budget gifts aren’t worthy. 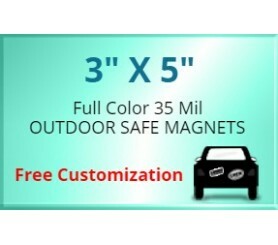 Request a quote to know price savings on wholesale orders of this custom 3x 5 inch square corner outdoor safe full color magnet.